Lately, a troubling issue has been flooding the market – counterfeit products. Today it’s not only a question of shoddy merchandise but sometimes it can even be downright dangerous – especially when it comes to life-influencing products like medication. The market has been clamoring for a new, cost-effective, easy-to-use solution for this problem and various companies have attempted to rise to the challenge with all sorts of answers. So you’re probably asking yourselves – what do QR Codes have to do with this? The answer is – a lot! 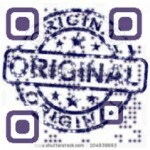 It seems that QR Codes are the most popular method for product authentication today. The reason for this is that QR Codes, or 2 dimensional barcodes as they’re also known, are an excellent offline-to-online solution which are very easy to create and print in large quantities and they can be scanned by anyone who has a smartphone and a generic QR Code scanner app. In addition, most customers are already familiar with using QR Codes and readily recognize them, dispensing with the need for market education. So how does it work? Most solutions that I’ve seen offer to print certain QR Codes onto a brand’s products which the brand’s customers can then scan to verify the product’s authenticity. When scanned, the customers are lead to a page which informs them whether the product is genuine or fake. More advanced solutions often include options of having the locations of products which have been pronounced as fake sent to the brand so that brands can keep track of areas that are tagged as gray markets. Is all this really necessary, you might wonder? Well, it seems that a lot of brands and customers think so. When counterfeit products are being pushed across the market, everybody loses. Authentication solutions are important for keeping up brand value and also for assuring the customer that they’re getting their value for money and aren’t being ripped off. And if brands can provide a simple solution which involves QR Codes, a platform that many customers recognize and know how to engage with, it seems that this growing issue can be nipped in the bud.